The Puplight is among the most unique new items that we’re seeing. Introduced more than five years ago, it’s not as popular as it should be and to be honest we just don’t know why. Everyone walks their dog at night and everyone who has a dog wants to do their best to keep it, and you save. Introduced in 2004, the Puplight hangs from your dogs collar and provides light for you and your dog, as well as providing a means where others can see your dog and avoid it. At it’s introduction the Puplight was seen at the American Pet Product Manufacturer’s Trade show where it was promptly called one of 12 “Top Dogs” of the show–and the is was in a field of more than 600 brand new products. – Top 5% of new products at the Petco Trade Show 2004. 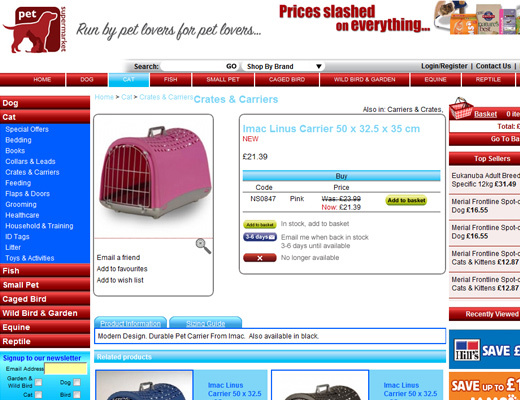 – Editor’s Choice by Pet Product News for 2004/2005. What does Puplight do? It keeps you and your dog safe by making you more visible. It is convenient, its not at all hard to use. It makes you feel more secure at night, and it helps you to located your dog whether he’s in a fenced yard or on a leash. It definitely helps to keep your dog safer from traffic when you’re on the road or stopped to use the restroom. It makes it easier for you to walk the dog at night or less of a hassle when you’re out walking in the evening and don’t make it home before dark. It helps those older dogs who’s vision may be fading a little to see better when they are walking in evening and at night. In fact, with the light up feature, thePuplight can even make it more secure for you. Having a light reduces your risk of being assaulted by lighting up the area, and lighting up your dog. Our personal opinion is that this Puplight product can offer some real advantages and is probably worth a good long second look if you’re in the market for a way to light up your world. 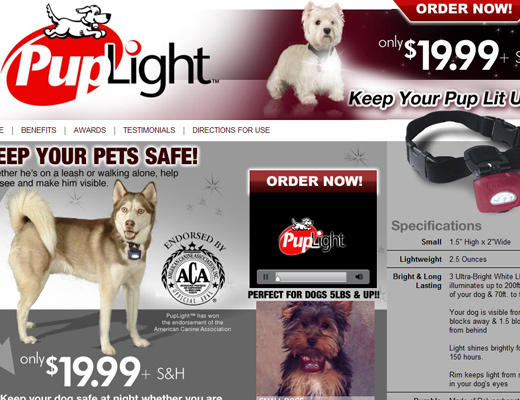 email to puplight@aol.com or call 1-866-787-5444.